Scoring a goal is the ultimate achievement in the game of football, because without the goal you can’t win the game. Over the years there have been many incredible goals scored by many incredible players, and it would be impossible to list them all or make any list. Everyone has their list of goals and I am no different. I am fortunate enough to have watched these matches on my TV and not just watched the highlights in a YouTube clip. This is my list of five memorable goals and the iconic players that scored them. Manchester United had been reduced to 10 players after the sending off of Roy Keane and Schmeichel had saved a Bergkamp penalty to keep the score leveled. The game ended in a 1-1 draw and the match was sent to extra time. In extra time with only 10 minutes left before a penalty shootout would decide the winner, Ryan Giggs takes possession of the ball and scores one of the most memorable goals not only in Manchester United history but also in FA Cup history. This goal holds a very similar resemblance to the one Maradona scored against England in the 1986 World Cup, but this time was the man many see as the successor to Maradona in the person of Lionel Messi. The goal came in an important semifinal against Getafe, but it wasn’t enough to see Barcelona advance to the final. Barcelona won the match 5-2, but lost the second leg in Getafe 4-0. Netherlands has had many great teams over the years but this was the first major title won by them. Marco van Basten cemented his legacy not only with winning this major tournament for his country but by scoring one of the greatest goals in Euro Cup history. He led the tournament with 5 goals and was also named the player of the tournament. The game was tied 1-1 when Zidane scores one of the most incredible goals in Champions League history. It would also turn out to be the game winner and give Real Madrid the so desired Champions League trophy. 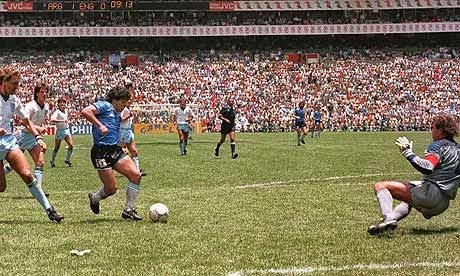 The 1986 World Cup was marked by two goals, both scored by Maradona and both in the same game. To me the greatest goal ever scored in any competition was the second goal scored by Maradona against England in the 1986 World Cup. The 55th minute of that game will always be marked by the incredible run from Maradona that ended with him putting the ball by English goalkeeper Peter Shilton. Mid-Week Rants: Recent FIFA Designs are BRUTAL! The Monday Meltdown: Half and Half Kits?! How Good is Bayern Munich? Playing Away: Is Mesut Ozil the New John Terry?